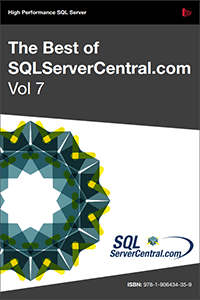 SQLServerCentral crossed a million members this year and once again we are reprinting some of the best articles, the most popular, and the most read in dead tree format. We wanted to give our authors a chance to see their names in print as well as give you an off-line resource that you can take with you wherever you may need it-most likely at your bedside to help you drop off at night :), for commutes, holding your coffee cup, whatever. This is our seventh volume and it’s become an annual tradition. We would also like to thank everyone for their support both on the website as well as by purchasing this book. Your visits to the site, clicking through to advertisers, purchasing products, registering for PASS, all help us continue this community and provide you with a valuable resource that hopefully helps you learn, perform better at your job, and grow your career. We’d like to encourage all of you to submit an article next year! This is a community that includes all of you and we aren’t looking for only the gurus to contribute. We love hearing about the real world you all live in and deal with on a daily basis. We try to get at least one article from each author and send you a couple copies of the book. That wasn’t possible this year with the economy down and a record number of authors writing content this year. However that should encourage all of you to work a little harder next year and write something great. A couple hints: real world situations and basic content on one focused area go over the best. These are great for your bookshelf and they make a great Mother’s Day present. Think about sending something in next year. Once again, thanks so much for your support and we look forward to another volume next year.